The DC3000 provides a new level of performance in connecting switches and routers to an unstructured or structured E1 G.703/G.704 2.048Mbps leased line. The DC3000 provides the conversion necessary to connect the X.21 serial interface of a router to a 2Mbps leased line. The DC3000 offers conversion between an X.21 serial interface and an E1 line interface with BNC or RJ45 connector options. The DC3000 supports both unframed and framed (or fractional) operation. Fractional operation allows a number of 64kbps timeslots to be active, up to a maximum of 31 timeslots for a single E1 line. If timeslot 16 is bypassed, then a maximum of 30 timeslots (channels) can be accommodated. The DC3000 has a simple multi-function status LED and BIT switch configuration with comprehensive configuration and diagnostic information on the unit base label making the DC3000 a truly plug and play device. 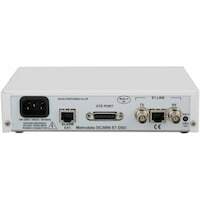 It is possible to connect the DC3000 to EIA-530 or RS-449 equipment using a converter cable. The DC3000 range can easily be rack mounted in either a 1U two unit rack mount kit, a 6U eighteen unit rack mount kit. This application shows a DC3000 connecting an X.21 router card to an E1 G.703 2.048Mbps leased line, such as a BT Megastream-2 service. X.21 serial ports are often the most cost effective WAN port available on routers. Most Telecom carriers provision E1 2.048Mbps services with G.703 connectivity. Care must be taken to ensure that the remote equipment is configured in a compatible manner (i.e. both ends unframed or both ends framed). If the leased line is framed then the equipment at both ends of the leased line must also be framed. This application shows a pair of DC3000 units connecting a pair of X.21 routers via an E1 G.703 2.048Mbps leased line, such as a BT Megastream-2 service. X.21 serial ports are often the most cost effective WAN port available on routers. Most Telecom carriers provision E1 2.048Mbps services with G.703 connectivity. Care must be taken to ensure that the remote equipment is configured in a compatible manner (i.e. both ends unframed or both ends framed). If the leased line is framed then the equipment at both ends of the leased line must also be framed. This application shows a DC3000 connecting an E1 G.704 router card to an X.21 Nx64kbps leased line, such as a BT Kilostream-N service. Care must be taken to ensure that the remote equipment is configured in a compatible manner (i.e. either X.21 or E1 G.704 framed). This application requires an X.21 DCE to X.21 DCE crossover cable. Please note that this application will NOT work where E1 timeslot integrity is required (e.g. when using channelised E1 cards in the routers). This application shows a pair of DC3000 units connecting a pair of E1 G.704 routers via an X.21 Nx64kbps leased line, such as a BT Kilostream-N service. Care must be taken to ensure that the remote equipment is configured in a compatible manner (i.e. either X.21 or E1 G.704 framed). This application requires the use of X.21 DCE to X.21 DCE crossover cables. Please note that this application will NOT work where E1 timeslot integrity is required (e.g. when using channelised E1 cards in the routers). This applications show a DC3000 being used to connect a PBX PRI port to a 2.048Mbps X.21 leased line, for when either an existing X.21 leased line is available for re-use or alternatively when X.21 connectivity has been provided rather than G.703 (e.g. for economic reasons). This application requires an X.21 DCE to X.21 DCE crossover cable. Please note that this application will NOT work over an Nx64kbps service, e.g. a BT Kilostream-N. This applications shows how a pair of PBX systems can be connected together via a 2.048Mbps leased line using a pair of DC3000 units. This would occur either when an existing X.21 leased line is available for re-use, or alternatively when an X.21 connectivity has been provided rather than G.703 (e.g. for economic reasons). This application requires the use of X.21 DCE to X.21 DCE crossover cables. Please note that this application will NOT work over an Nx64kbps service, e.g. a BT Kilostream-N. This application shows a DC3000 connecting an E1 G.704 router card to an EIA530 satellite modem. The DC3000 supports a number of different clocking modes, and so it is possible to source the clocking for this network from the satellite modems, from one of the terrestrial circuits or from a DC3000 or router. This application requires an X.21 DCE to EIA530 DCE crossover cable. Please note that this application will NOT work where E1 timeslot integrity is required (e.g. when using channelised E1 cards in the routers, or when using a PBX).